In addition to the music, there will be a Silent Auction. Proceeds will help BayKids to continue its work in support of hospitalized children. A special VIP ticket includes a complimentary drink upon arrival, private upstairs area for the entire event, a great view of the stage and signed poster from the band. Every person that attends this event will receive a FREE poster! 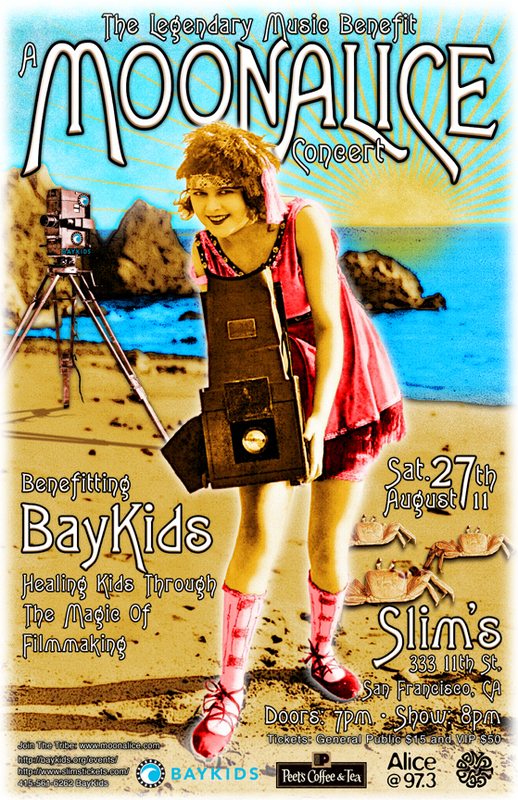 BayKids empowers children facing serious medical challenges to express themselves through the art and magic of filmmaking. They are committed to making a positive difference in the lives of hospitalized children by teaching them a wide range of moviemaking skills and helping them discover the power of self-expression. BayKids has evolved to focus its multimedia expertise on serving children in the Bay Area facing medical challenges. Working in partnership with Children’s Hospital and Research Center Oakland and UCSF Children’s Hospital, our digital filmmaking programs provide kids with the opportunity to explore their creativity while learning filmmaking, teamwork and leadership skills. As of July 2009, BayKids has helped over 5,000 children and their families get through cancer and other medical conditions.